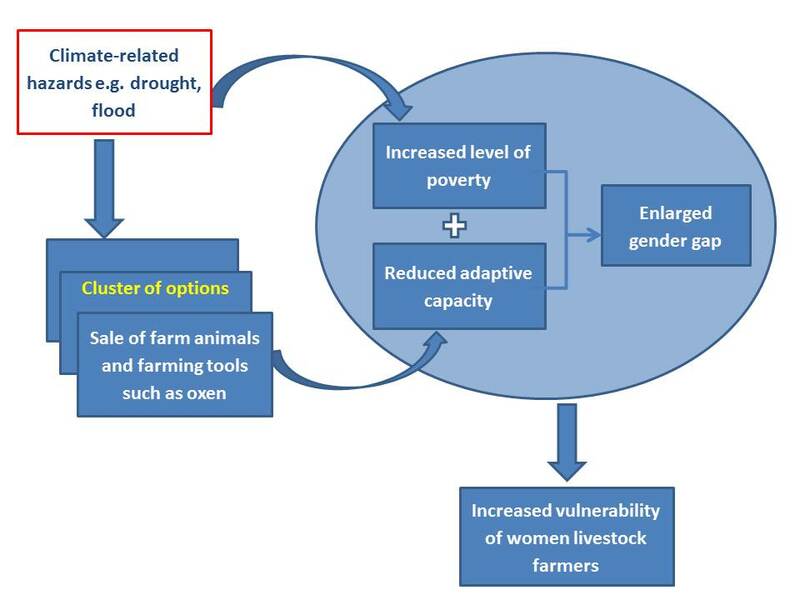 Figure 7 from page 23 of the report: Women livestock farmers’ vulnerability as a result of wrong coping strategies. The Gambian agricultural sector is predominantly traditional and largely dependent on rainfall, which lasts for four to five months of the year. In addition to tourism, agriculture is among the main pillars of the Gambian economy. With a population projection of 4,466,000 people by 2040 under a constant fertility scenario, agricultural productivity in The Gambia needs to increase substantially in order to meet future expected food demand. However, due to the reliance of agriculture on rainfall, and the predominance of extensive livestock farming, the sector will be increasingly affected by climate change. In The Gambia women farmers are particularly known for cultivating horticultural and food crops as well as keeping poultry and small ruminant species. The National Gender Policy (2010 - 2020) of the Gambia indicated that women smallholder farmers contribute up to 70% of the total national labour force but their productivity is hindered by many gender-defined factors. Despite their ability to improve climate change adaptation and livestock management, it has been documented that women still have limited access to resources, and are less involved in decision and policy making when compared to their male counterparts. This present research*, in the context of smallholder livestock farming system in The Gambia, aims to assess climate change adaptation issues confronting women livestock farmers and provide evidence that could inform policy. Identify approaches and policy options that the policy makers, planners and development workers could adopt in promoting the use of local livestock breeds and feed resources in order to enhance better adaption to climate change. This paper was published in Future of Food: Journal on Food, Agriculture and Society on 16 October 2017. *Download the full text from the right-hand column. Key points from regarding vulnerability and adaptation options are provided below. Please see the full text for more detail and references. This study was carried out in 2016. The policy documents of The Gambia on climate change were reviewed using content analysis. These include National Adaptation Programme of Action, Nationally Appropriate Mitigation Actions, Intended Nationally Determined Contribution of The Gambia, Agriculture and Natural Resources, Gambia National Agricultural Investment Programme, Gambia Environment Action Plan, and Poverty Reduction Strategy Paper. The keywords used in reviewing those documents include livestock, resilience, climate, women, and agriculture. Policy and stakeholder mapping was used to emphasize certain information, indicate trends of important events and categorize the identified groups of actors. Websites such as FAOSTAT and UNdata were accessed for secondary data. In addition to review of relevant literatures, certain individuals including farmers were interviewed with the use of a semi-structured questionnaire through telephone calls. Stakeholders for the two consultative seminars and policy dialogues were invited from farmers’ associations, community-based organization, women groups, non-governmental organizations, research institutions, government agencies, and private farming sector. The participants were divided into the two separate male and female groups but were given the same tasks to be accomplished through group discussions. Thereafter, there was a plenary session whereby the findings of each group was presented and further discussed. The Gambia is presently one of the most densely populated countries in Africa, with a population density of 179 persons per square kilometer. Cattle and chicken are the most common livestock species in the country; other livestock includes sheep, goats, horses, donkeys, pigs and poultry. Climate-related hazards observed include drought, flood, heat waves, torrential rainfall and unseasonal rains. Depending on their magnitude, these climate hazards have negative consequences on livestock species and the farmers whose livelihoods are sensitive to climate change. The 240,000 ha of rangeland and natural pasture on which livestock production depends upon are particularly vulnerable to the impacts of climate change, and need to be sustainably exploited to safeguard against undesirable consequences. Due to dependance on these rain-fed pastures as a feed resource, Gambia's livestock subsector and its farmers are prone to climate-related hazards. Seasonal migration of animals and herdsmen in search of both water and grasses occurs during the dry season. However, many rangelands are owned by communities and are not well managed, resulting in low productivity. This issue is exacerbated by the loss of pastures due to indiscriminate bush burning during the dry season. To date drought, in particular, has already contributed to the death of farm animals. Significant reductions in milk yield, growth and reproductive rates were also documented. Indirect effects of climate change on livestock species and their owners include costs of treating sick animals and controlling the spread of disease. The selling of assets, including farm animals, as a coping strategy, during climate-related hazards, is very common in The Gambia. The immediate consequence of this strategy is a gradual reduction in livestock-based assets of those vulnerable farmers, especially the women. Because such act can diminish the adaptive capacities of farmers, they are prone to deeper level of poverty and other unintended social consequences. Women livestock farmers, because of their dual productive and reproductive activities, are usually much more affected than their male counterparts. The poultry and small ruminant species which many smallholder women farmers rely upon are also sensitive to stress caused by climatic elements such as extreme temperature and high relative humidity. The physical assets of women include locally adapted breeds of animals such as West African Dwarf goat, Djallonke sheep, and N’Dama cattle. There are also various feed resources and feed production strategies, such as the use of crop residues preserved on the roofs of houses for feeding cattle, goat and sheep during the dry season, which is used by many farmers. However, this is still insufficient in terms of quantity and quality required for maintaining the nutritional levels of those animals and there has been little research done on the potential of adaptive breeds and feed resources in the Gambian context. This lack of reliable data for resource planning and poor exchange of data among the stakeholders was reported in the Gambia ANR policy. The Gambian women livestock farmers' abilities to diversify into non-agricultural sources of livelihood, indigenous knowledge and access to family labour has the potential to increase their resilience, but these options need further exploration. The result of an exercise about preferred adaptation options taken by the stakeholders who were divided into male and female groups is presented in Table 5 (below). Some ways of improving livestock farmers’ resilience and adaptive capacities, such as animal vaccination, restricted grazing, domestication of fast-growing small animals were suggested by both male and female groups. The two groups also agreed that improved animal watering will reduce exposure of animals to climatic stressors such as high temperature. However, the male and female groups differed in their opinions concerning how controlled use of bush fire, rangeland regeneration and management could enhance livestock farmers’ resilience. Vision 2020 of The Gambian government emphasises the need for ‘partnership between women and men, as well as mutual respect and understanding on issues pertaining to gender and development’. It was also a policy objective of the ANR sector to mainstream gender in all programmes and projects with particular attention on providing support to women in order to increase their productivity and competitiveness. The Gambian government is expected to take the leading role in enhancing women livestock farmers’ resilience to climate change. In addition to policy design, implementation and monitoring, the government will also need to work in partnership with international organizations, NGOs and the private sectors toward ensuring a climate-resilient economy. Since gender is an important cross-cutting issue in climate change adaptation, every stakeholder should ensure that it is well incorporated into initiatives, project and programmes targeting both men and women livestock farmers. Meanwhile, efforts to enhance climate change adaptation strategies of livestock farmers should not be dissociated from economic development because of their synergistic effects. The task of enhancing the adaptive capacities of women livestock farmers will require active involvement and coordination among many stakeholders. In Table 6, various stakeholder groups and their expected roles toward in enhancing women livestock farmers’ adaptation strategies are presented. Based on internet searches and consultation and review of relevant documents, a number of key stakeholders have been identified who, among many others, are essential for enhancing the adaptive capacities of Gambian women livestock farmers. These are listed in Table 7, on pages 19-20 of the full report.